Whale sharks are dangerously on the decline, with The Dodo reporting that 50 percent of the population has been killed in the last 75 years alone. So when Sea Shepherd Global - an organization that works to preserve marine life - released a video showing their crew releasing one of these majestic, and threatened animals from a fishing net - it went viral and received praise from around the world. One Green Planet explains that much of the whale sharks recent decline is due to by-catch, or non-target marine life netting that looks to catch a certain fish to sell on the market - but often ends up trapping other animals like whales, sharks, seals, dolphins, and sea turtles. Sea Shepherd Global also notes that these whale sharks were, and still are hunted for their meat, fins and oils too. 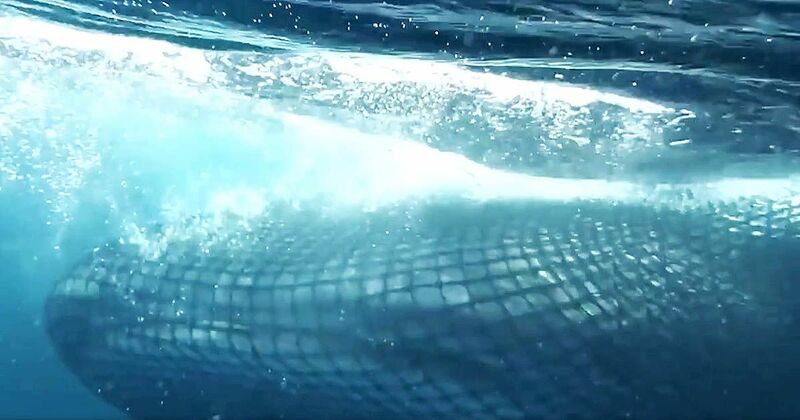 In the viral video, you can see that a whale shark was one of the unsuspected targets of this dangerous form of netting. The Sea Shepherd Global Team -working under Operation Albacore off Gabon - was in the area patrolling that day, and was able to free this animal from an otherwise imminent and untimely death. The conservation of these animals is needed. The World Wildlife Foundation explains that they are not only the biggest fish in the world, but the biggest sharks - and that seeing them scattered across our oceans is an indicator that the waters are filled with good plankton, and are healthy. Check out the harrowing video below to see one of these great creatures be freed to once again roam the ocean. A whale shark was tangled in a net, so people dove in to help him.